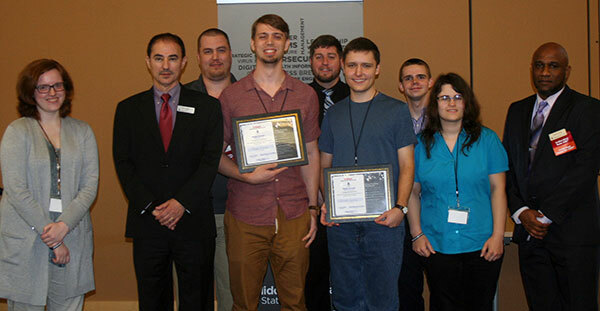 Roger Rambo, a Middle Georgia State junior majoring in Information Technology, is the winner of the University's first "capture the flag" (CTF) competition, called the Cyber Knights Banner Challenge, held in February 2018. "Each year, cyber attacks increase and college and university IT programs are challenged to find new ways to prepare students," said Professor Nelbert 'Doc' St. Clair, director of Program and Outreach for MGA's Center for Cybersecurity Education and Applied Research. "IT majors must understand how hackers can penetrate company networks and find ways to defend against attacks." Rambo's name will be engraved on a plaque that will be displayed in the School of IT, which plans to make the Banner Challenge an annual event. He also received an EC- Council Certified Ethical Hacker training package worth more than $1,000. This year’s Banner Challenge covered the areas of Stenography, Code Analysis, Encryption, Hashing, and Network Traffic Analysis. The Cyber Knights Banner Challenge was created by the Cyber Knights, a student club. St. Clair is the club's advisor. MGA students interested in joining the club can contact him at nelbert.stclair@mga.edu. Learn more about the Center for Cybersecurity Education and Applied Research at www.mga.edu/ccear.